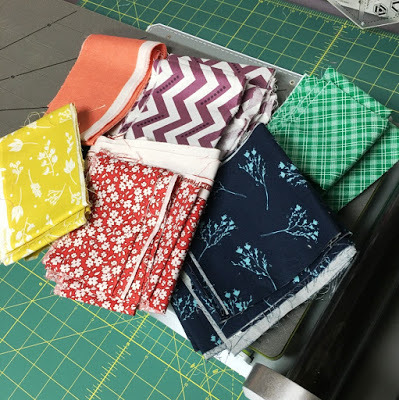 And if it is one thing we quilters have in spades, it's scraps! I decided to start out with a Valentine's Day wreath, since it is just around the corner, so these are my pink and red buckets. ;) I find it helpful to store my scraps by colors. 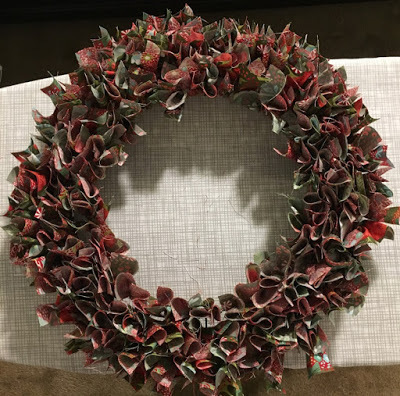 So let's get into how to make this wreath! Now, this is where I saved some serious time. 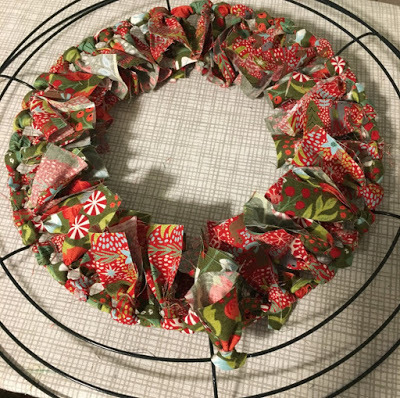 For each wreath, you need approximately 350, 1½" x 6½" strips. 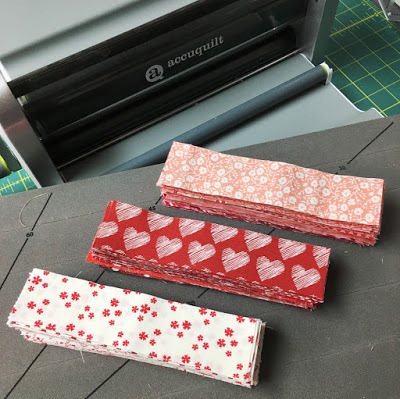 We all know, cutting scraps takes more time and is more tedious than cutting yardage, but of course, we still want to use them. 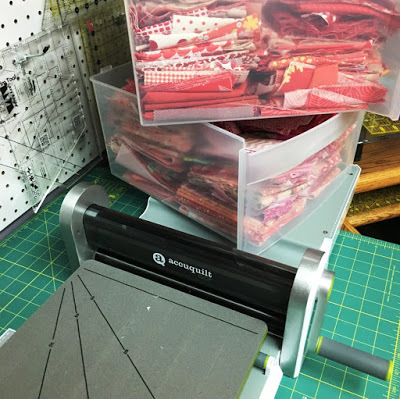 :) And since I got my new AccuQuilt GO!® (that I wrote about back here), I can't stop thinking of ways to use it to cut up my scraps, which is good, because I have a lot of them! 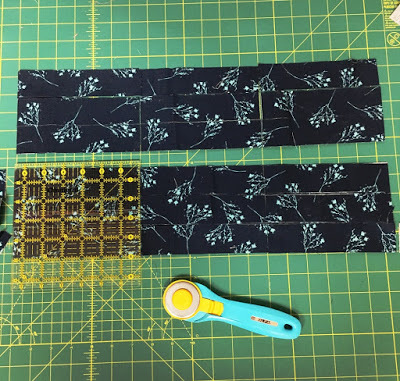 So I was delighted to find that AccuQuilt made a GO! 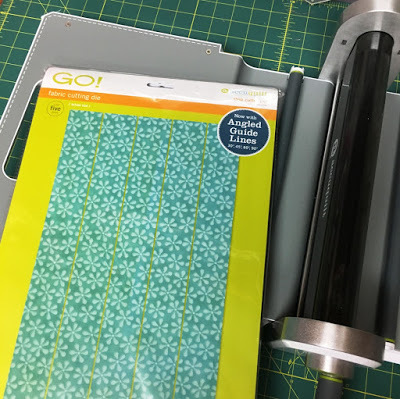 Strip Cutter-1½" (1" Finished) die that can be used in my GO!. I just took scraps and stacked them on top of the die making sure to line them up with the easy to see lines of the die. ;) I didn't worry about the size of the scrap, just stacked the larger ones first, and then the smaller ones on top of them. You can stack up to 6 layers and if you have large prints (like the text one) you can always fan fold them. Then I did a quick pass through the GO! to cut all of the strips. I learned a new little tip from this AccuQuilt video: slide your mat off, so that all your pieces stay aligned on the die. 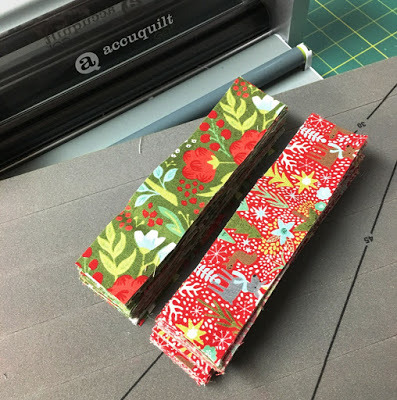 Then simply use a 6½" ruler aligned on your strips and sub-cut all of the strips in a row to 1½" x 6½". 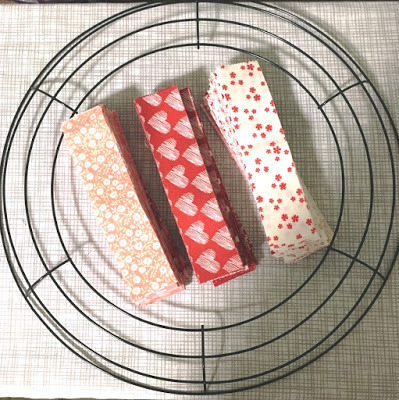 Because they are stacked and aligned, you can cut a ton of strips all at once as shown. I realized one of the craziest scraps that I try and figure out what to do with are the leftovers from my quilt backs. You know, the four sides that you trim off and are a little crazy wonky? 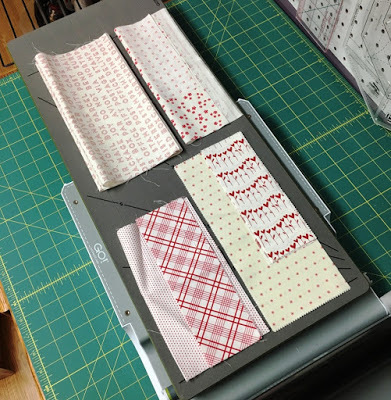 The ones that make you think, "I could use these for a binding strip", but there is never enough for a whole quilt. Well, I figured, what better thing to use them for than tiny strips! 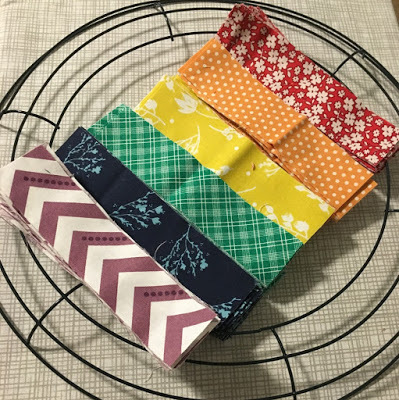 So, I grabbed a rainbow of quilt back leftovers (which is awesome because they take up too much room in the scrap drawers) and made a little more noticeable dent in my collection. I figured they would make a great birthday wreath! And these are simple to stack on the GO! Strip Cutter-1½" (1" Finished) die. Just fan fold them long ways back and forth over the die lines. Then run them through the GO!, simple as that. 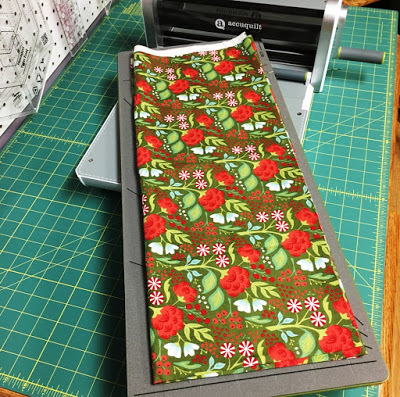 Just like before, slide your mat off and align the strips onto your cutting mat. Then sub cut all your long strips into 1½" x 6½" strips. These were so fast to cut! And just like that, I had a rainbow of strips. I did about 60, or just over a ½" stacked, of each color. Isn't that rainbow just too fun? And I am just thrilled to use those quilt back leftovers! 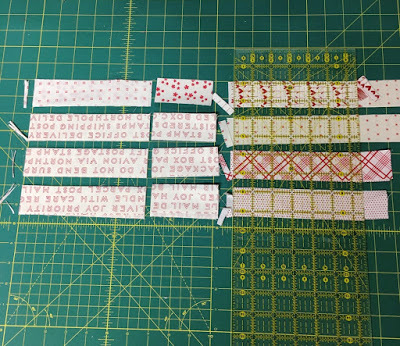 Of course, if you don't save scraps, you can always just cut the strips from yardage. And it is going to be so super fast and easy. 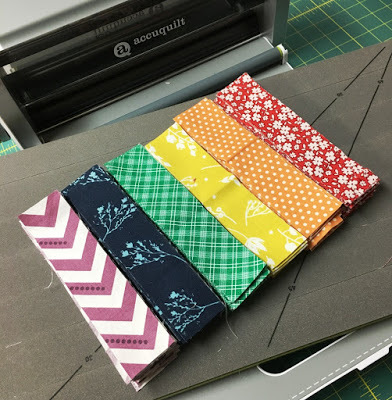 Simply fan fold your yardage on the GO! Strip Cutter-1½" (1" Finished) die, keeping it folded the way it comes off the bolt as shown. Then run it through the GO!. 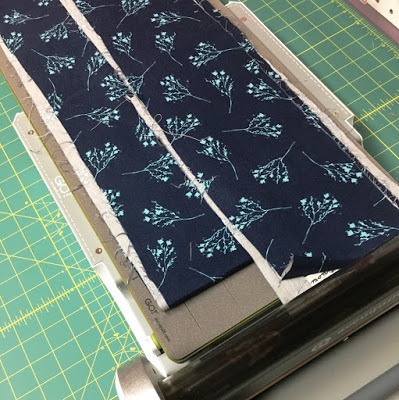 Again, slide your mat off, align the strips onto your cutting mat and sub cut all your long strips into 1½" x 6½" strips. These were so fast to cut! You can get 72, 1½" x 6½" strips per ½ yard. 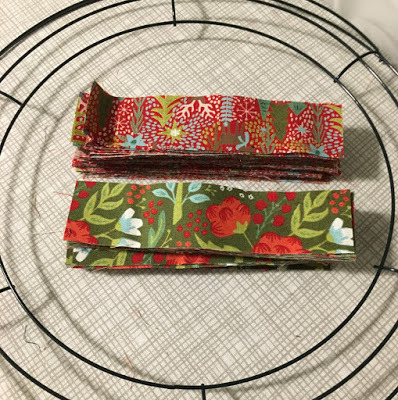 So, where I was wanting to make a 2-print wreath, I used 1¼ yards of each of the two prints to make 360 strips. There's a quick run down on the cutting. However and whatever you choose to cut (if you had some leftover honey buns they work great for this too!). 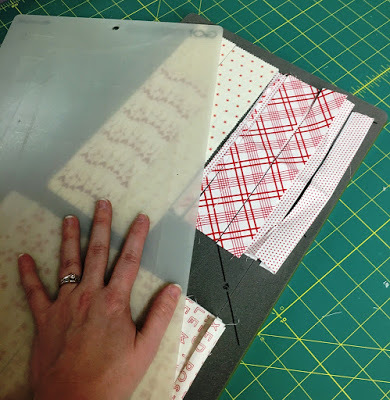 In the end, you want to have approximately 350, 1½" x 6½" strips. 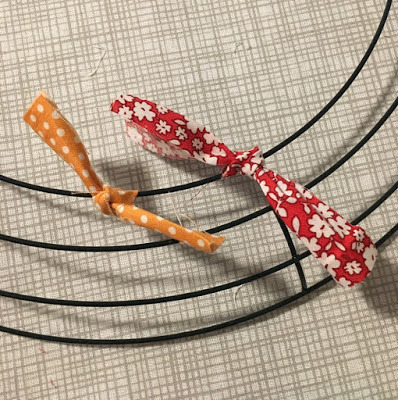 Now that your strips are all cut, you are ready to tie your wreath! 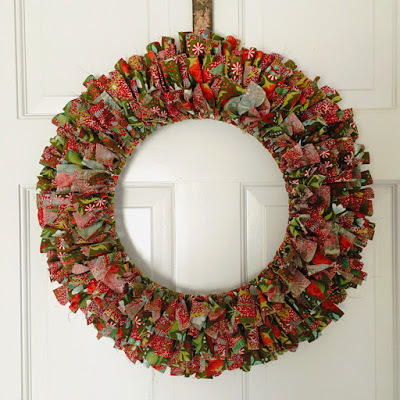 You will need a simple wreath frame. These can be found in lots of stores. I have seen them at my local craft store, Wal-Mart, and I actually found these at the Dollar Store. Sweet! My frame is a 14" circle. If yours is a little smaller, you can use less strips; and a little larger will need more strips. 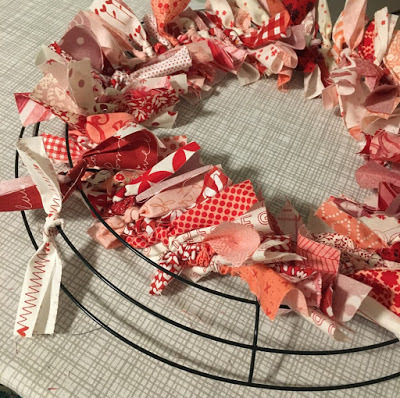 Let's start tying that Valentine's Day Wreath! Once you have finished tying the first ring, you can move outward. I found it easiest to tie the second ring and third ring at the same time as it made it easier to deal with all of the other strips in the "way". I like to tie 4-5 strips onto the second ring and then 4-5 on the third ring, alternating back and forth until you have tied all the way around the second and third ring. 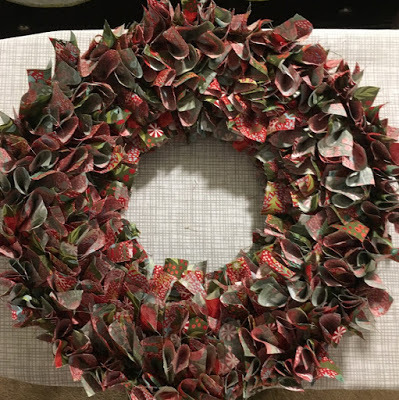 And, if a few strips wind up in the back of the wreath, no worries. We'll poke them all out at the end. For now, just worry about tying. All that is left is that outer, fourth ring. Just push that third ring out of the way a bit and tie around the outside ring. These will tend to want to flip backwards a lot, but no worries, we will fix that at the end. Once you have gone all the way around the outer ring, you can now poke out all of those little "flipped" strips. I found the easiest way to do this was to wedge my fingers through the rings from the back around each of the four rings. This just pushed out all of the strips to the front. Then flip it over and "fluff" it from the front. 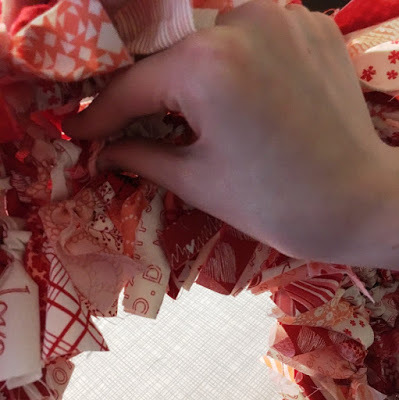 And just like that, you have a beautiful Scrappy Fabric Wreath! Isn't that just so fun! 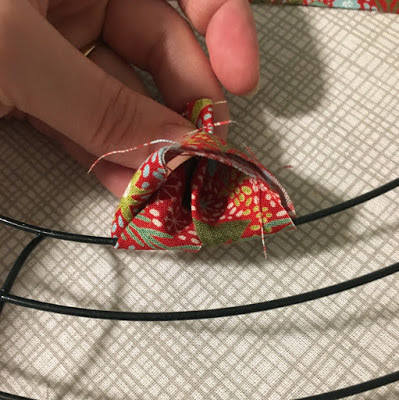 It used up a ton of fabric scraps, double bonus! How great is this going to look on the front door in February! 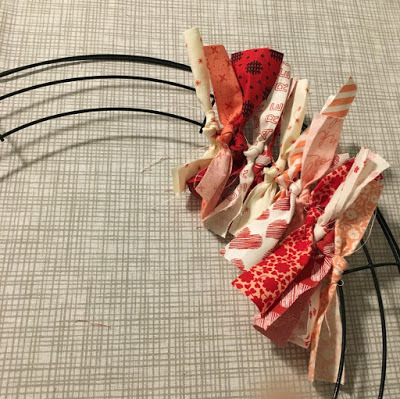 Since I couldn't stop at cutting out strips, I figured I can share a few alternate ways of making your wreath. 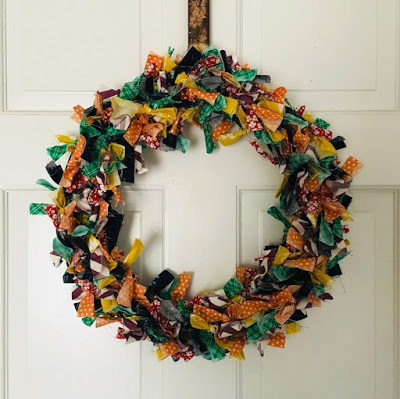 If you have a screen door and don't want your wreath to get "flattened" you can always use a Double Knot. It will also make your knots more secure. When tying, rather than just tying one knot, do two, making a square knot. Remember: right over left and then left over right. The red strip below is a single and the orange is a double. You can see the difference it makes. The double knot will be shorter but have a fun "bunchy" look to it. Just like before, do the inner ring first and then continue out doing the second and third ring together and then on to the fourth ring. For this wreath, we just alternated the fabrics in rainbow color order. My daughter was tying this wreath and decided when she got to the fourth ring that she was done. That's always another option which gives you a wire to hang the wreath on. So, if you run out of strips or just get tired of tying, you can always just do the inner three rings. 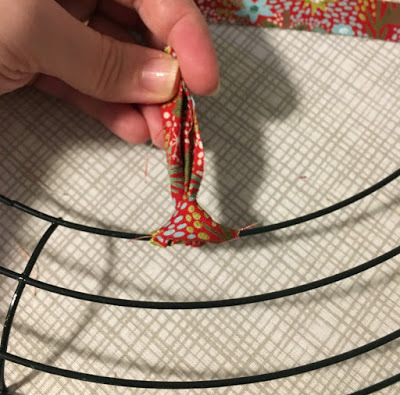 Once you are done tying, pop out all your strip sets as shown before. 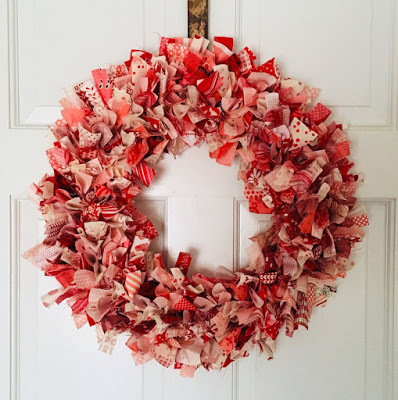 You will have a cute little bunchy scrappy fabric wreath. We even already had a birthday at our house to use it for! Nothing says, "Happy Birthday" like a rainbow of scrappy goodness, right? Finally, the last variation of tying your knots. This one is fun because it gives you three options for different looking wreaths at the end. 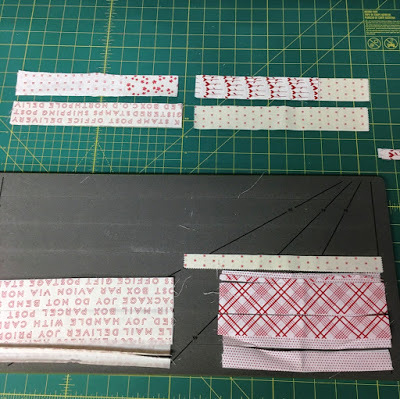 Again, start by folding the strip in half lengthwise with wrong sides together. Then hook the strip behind the inner frame as shown below. Pull tight and you have a cute little slip knot. 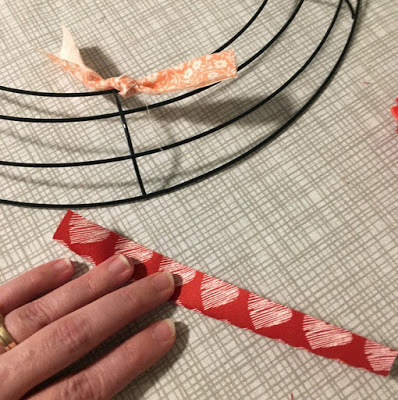 If you have a crochet hook, it can make it a little easier than using your fingers. This might sound kind of crazy, but I couldn't find a crochet hook in my house. ;) No matter, it's still pretty easy to do with your fingers. I alternated my two Christmas prints. And, just like before, inner circle first. Although different from before, this one I found easier to do all of the second ring, and then all of the third ring. Where you can just turn all of the slip knots inwards, that don't tend to get in the way very much. Here is where the fun is. 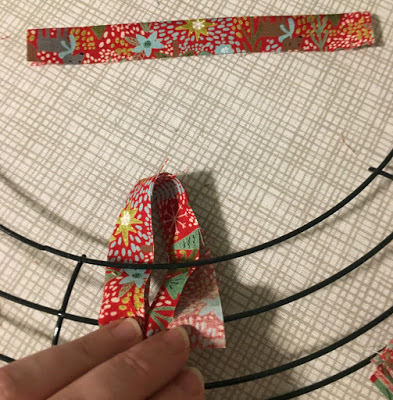 Once you have all of your strips tied on, you can leave the strip sets pointed inward and the wreath will look like this. Or, you can go all the way and spin the slip knots outward like this. 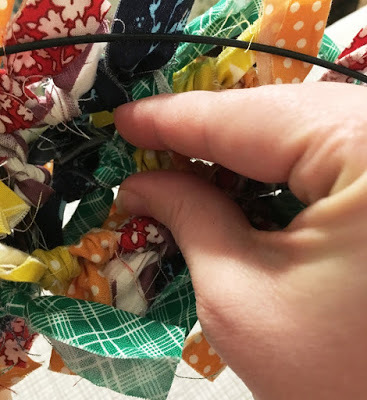 Whichever way you like it, they all make for a super adorable scrappy fabric wreath! Now I am all set for next Christmas, too! That's how they are done! 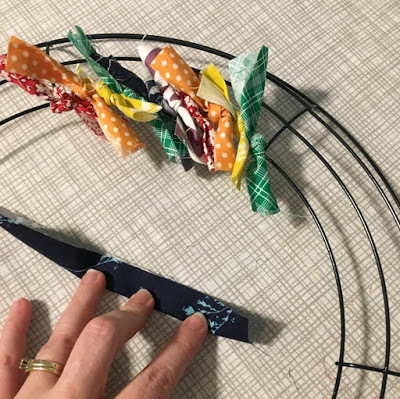 Scrappy fabric wreaths that are super fun and super fast. Of course, you can make them for any holiday or occasion. 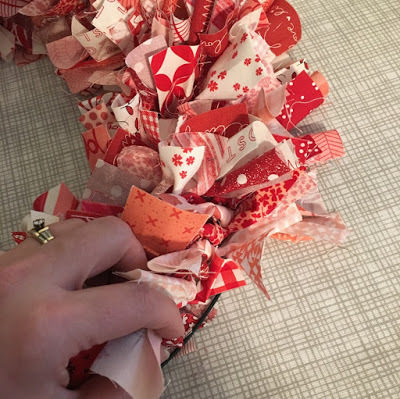 Just pull out the coordinating fabric scraps and away you go. I think I need to make one for Easter next. ;) They make you feel so great when you are done because you have just busted more fabric scraps, yippee! Check out the original post on Melissa's blog. Also, for amazing tutorials, be sure to subscribe to our email list! Want to print or save this tutorial for later? Fill out the form below to download and save!